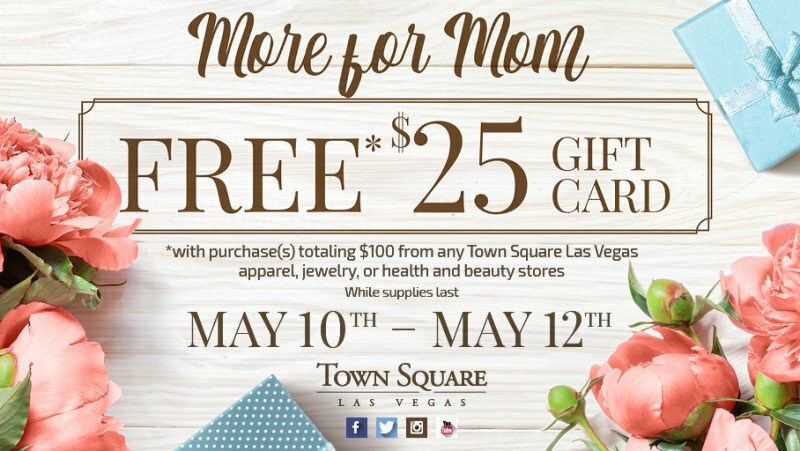 FREE $25 Gift Card with purchases totaling $100 from any Town Square Las Vegas apparel, jewelry, or health and beauty stores. *Present original receipt(s) dated May 10th through May 12th totaling $100 or more from any Town Square Las Vegas apparel, jewelry, or health and beauty stores at the Concierge Booth and receive one $25 TSLV Gift Card. One Gift Card per customer, per receipt, while supplies last from May 10th through May 12th.